The Bath Cafe recently sent me this amazing package to review! I was able to try 2 amazing sugar scrub scents Dreamsicle, Lavendar Vanilla, 2 bath bomb pops in Sweet Thang, and Natural Body Oil in Citrus. I have never enjoyed a bath anymore than this one. I tried each product separately as I wanted to evaluate each. My favorite was the Citrus Natural Body Oil. The Body Oil has Argan Oil one of my favorite oils in it. I came up with so many uses for this, I put it in the tub and it made my skis so silky soft. I used it on my hair and it even perks up the dry ends I have. I also used it just as a natural body oil it smells so subtle and fresh and softens skin so great! I would have to say I enjoyed the Bath Bombs just as much as the sugar scrub the scents that the bath bombs and the sugar scrubs had are simply invigorating. The Bath Bomb Pops in Sweet Thang were the best scent I think I ever smelled in my life! Not to strong, not to weak just perfect. 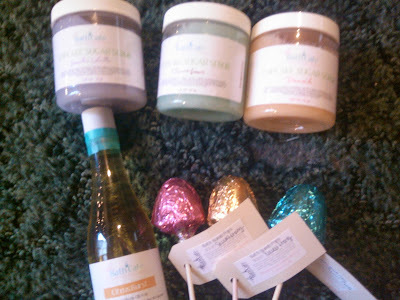 I loved the Dreamsicle and Lavander Vanilla Sugar Scrub as well. The Dreamsicle Sugar Scrub even had little sprinkles in the top. The Bath Cafe doesn't miss anything when making unique quality products. I have never seen a company take such care and delight in their products. To purchase from the Bath Cafe go to http://www.thebathcafe.com/ and make sure you are following them here on facebook as well https://www.facebook.com/bathcafe. The Bath Cafe is also giving one of my readers a chance to win! Enter via the rafflecopter below! WOW, What an awesome product to try.